The sciatic nerve is the largest and also the longest nerve in your body. It starts as a group of nerve fibers, called nerve roots, in your lower spine. It runs from your lower back, down the back of each leg and on into your feet and toes. 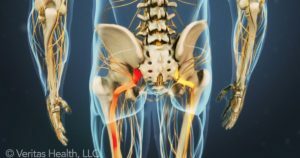 There are several conditions that can lead to sciatica or an irritation of the sciatic nerve. Nerves which run through narrow spaces are particularly vulnerable to nerve compression. A pinched nerve is caused by too much compression, or pressure, on a nerve from the tissues that surround it. The pressure affects the way the nerve functions. This pressure is sometimes caused by muscles or tendons. In other cases, it might be bone or cartilage. 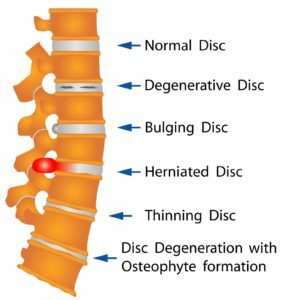 A herniated spinal disk can compress a nerve and cause pain. A pinched nerve can also be caused by lumbar stenosis, which is compression of the spinal nerve roots in the lower back. Piriformis syndrome occurs when the sciatic nerve is compressed by a tight piriformis muscle, located in the buttocks. You may wonder what a pinched nerve feels like. Your nerves send important messages to your body. Pain is a message that something is wrong. You should pay attention to it. The location of a pinched nerve may affect your symptoms, but most pinched nerves cause pain and tenderness. Some pain from a pinched nerve may be shooting or tingling, may come and go or may spread from one body part to another. If you are experiencing symptoms, try a simple home test to determine if a pinched nerve is the problem. Sit upright, with your hands held together behind your back. Assume a slumped position, then raise a knee to your chest, then repeat with the other leg. Pain, or inability to perform this exercise, may be an indication of stenosis. Sit on a chair with your shoulders slumped forward. Raise one or both of your legs out in front of you. A radiating pain in your leg may indicate a herniated disc. 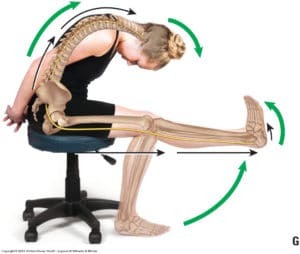 Sit on a chair with your hands behind your back and slump forward. Then bend your neck forward and lift one leg up with the toes pointed toward you. If this causes pain, you may have a nerve problem. Then try lifting your head a little and see if the pain lessens. If so, it is likely to be a nerve problem, because only the nerve is moving when you lift your head, not the glute or hamstring muscles. If you are experiencing pain from a pinched nerve, there are home therapies you can try. Among these are over the counter pain medication; cold packs or cold massages, alternating with heat; and resting either on your back, with a pillow under your knees, or on your side with a pillow between your knees. If you are unable to relieve the symptoms, you may benefit from physical therapy. The goal of physical therapy is to get to the root cause of your problem and not treat just the symptoms. Appropriate treatment will reduce pain, improve function and help you develop a maintenance plan to stay pain-free. Your physical therapist may use passive physical therapy or active exercises to achieve your goals. A pinched nerve should not be ignored. It can cause either minor damage or severe harm. The resulting pain and limitations may be temporary or long-term issues. If you are concerned about a possible pinched nerve or nerve compression, it is best to get a diagnosis and start treatment as early as possible. Don’t suffer needlessly. If you are experiencing symptoms, contact us at Cawley Physical Therapy and Rehabilitation. You do not need a doctor’s referral or prescription. Our dedicated Doctors of physical therapy are here to help. To reach us via phone, call our main office at 570-208-2787 or email us at cawleyptfrank@gmail.com!